BRIG.-GEN. ALONZO ALDEN, son of Isaac and Hannah (Snow) Alden, was born July 18, 1834, at Wadham's Mills, in the town of Westport, Essex Co., N. Y., being the youngest of eight children. His mother was the first white child born in the locality where Montpelier, Vt. now stands. His father was of the good old Puritan stock, being a lineal descendant of the illustrious John Alden, who came over in the Mayflower and was for many years lieutenant-governor of Plymouth Colony. Isaac Alden did active service in the war of 1812, and afterwards engaged in farming, lumbering, etc. In 1839 he purchased a well-wooded farm and a saw-mill in the town of Lewis, on the Boquet River, three miles north of Wadham's Mills. With lumbering, managing a saw-mill, making charcoal, and farming, he kept his boys steadily at work, with the exception of about three months, when he accorded them the privilege of attending the district school. At the age of thirteen Alonzo was required to do a man's work. He could burn coal-pits as skillfully as any backwoodsman, cut and pile two cords of hard wood daily; and when his day's work was over he would milk a half-dozen cows, and then be in excellent trim for a vigorous game of "hide-and-seek" among the wood-piles with the neighbors' boys. Thus was laid the foundation of that iron constitution which, in after-years, proved of invaluable service to him, until it was shattered by wounds received while fighting for the Union in the war of the Rebellion. At the age of seventeen, in the year 1851, he entered the academy at Keeseville, where he pursued his studies till the autumn of 1853. He was enabled to meet his own expenses at the academy of teaching school in the winter time. During the last year of his academic course his chum and intimate friend was the celebrated Joseph Cook, now of Boston, Mass. The Presbyterian Church of Keeseville was at that time blessed with the ministrations of that eloaquent divine, the Rev. John Mattocks. Through his influence, Joseph Cook, Alonzo Alden, and several other students united with the church at the same time upon profession of their faith. The subject of our sketch always declares that this was the most important event of his life. In the winter of 1853-54 he taught a private school in Westport, and in the fall of 1854 entered the Collegiate Institute at Sand Lake, Rensselaer Co., living with his brother, Joseph J. Alden, who was one of the proprietors of the Sand Lake Warp-Mills, in that village. The fall of 1855 witnessed his matriculation at Williams College, Massachusetts. His vacations and portions of term time were occupied with teaching in public and academic schools, and yet by "burning the midnight oil" he was able to keep pace with his class, graduating with honor in August, 1859. After leaving college he began the study of law in the office of Gale & Alden, in Troy, and continued there until the spring of 1861. He was admitted to the bar and entered the volunteer army about the same time. Those who knew him well as a law student recognized in him abilities of a high order. Had he remained at home and followed the profession of law, undoubtedly he would have taken a high position among the lawyers of the Empire State. At the outbreak of the civil war, in 1861, Alonzo Alden was among the first to respond to the call of his country for men to come to her defense. Forsaking his chosen profession and putting aside all the bright hopes of early manhood, on April 18, 1861, he enlisted as a private in a company being formed by Capt. John M. Landon. He rendered effective service in filling up the company by visiting different towns in the county, making war speeches, and securing recruits. Upon the completion of the organization of the company he was mustered into the service, May 14, 1861, in Company I, of the 30th N. Y. Volunteers. He was elected, by vote of the company, 2d lieutenant, with rank from May 14th. The regiment, in command of Col. Frisby, went to Washington, encamped for a season at Brightwood, in a grove at the junction of Seventh and Fourteenth Streets, then went into winter quarters across the Potomc. Lieut. Alden was with his company in all its trying experiences of outpost duty, long marches, severe drills and discipline during the spring and summer of 1862, participating with the company, in connection with McDowell's corps, in the first capture and occupation of Falmouth and Fredericksburg. When not on duty with his company he devoted himself with great assiduity to the study of military tactics and the art and science of war. He was regarded in the regiment as good authority on all points pertaining to company and regimental evolutions. On the 10th of June, 1862, he was made adjutant of the regiment, which position he filled with great acceptability until he was prostrated by typhoid fever at Falmouth, Va., and was sent to a hospital in Washington. Here his brother, Charles L. (of the law firm of Gale & Alden), met him, having been summoned thither by telegraph. The Rev. Dr. John C. Smith and wife, of Washington, secured his removal to more comfortable quarters at a private house, where for three weeks he ws tenderly nursed by his brother and Mrs. Smith. For several days his life was despaired of; but convalescing, he was taken to his home at Troy. Sept. 25, 1862, the 169th Regiment New York Volunteers having been organized by the war committee of Rensselaer County, Adjutant Alden was commissioned by Governor Morgan as mahor of this new regiment. The lessons learned in his first sixteen months of service in the 30th Regiment were invaluable in fitting him for the higher position which he was called to fill in the 169th. With this regiment the principal events of his brilliant military career are associated. His tactical knowledge was at once brough into play, and in this and his discipline he was recognized as an officer who knew his duty, and knowing it, was ready and eager to perform. When the regiment reached Saginaw, in compliance with a general order fromthe War Department, Maj. Alden was at once designated as the regimental referee, with all the jurisdiction of regimental court-martial. His strict admnistration of the office and his rigit enforcement of discipline soon satisfied the command that war was a reality and that army regulations meant something beyond words. Of course he met with the prejudices of those who came under his censure, and was regarded with disfavor by those who had not learned the importance of discipline. 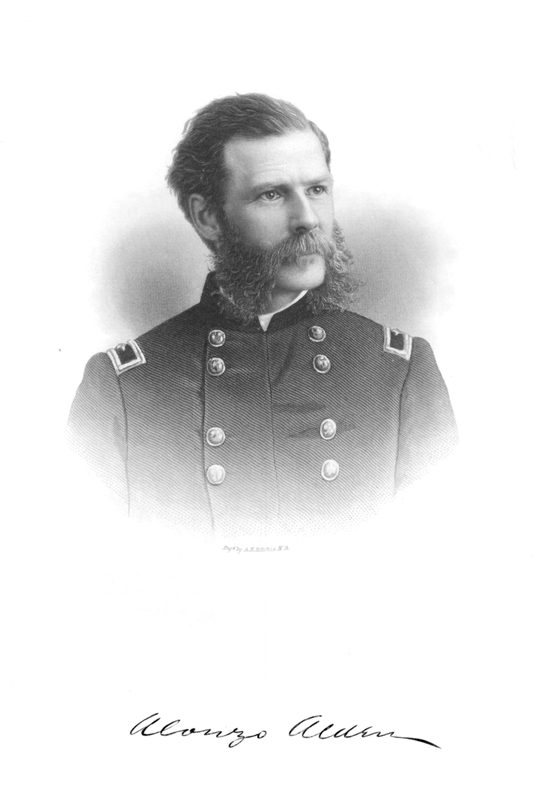 In November, 1862, Maj. Alden assumed command of the regiment, Col. Buel being in command of the brigade, and Lieut.-Col. McConihe being disabled from the effects of an old wound. The regiment was ordered to Washington in February, 1863, and Maj. Alden was detached to take command of the district of Georgetown, a position which he held until the regiment was ordered to Suffolk, Va. While at Suffolk he was a participant in the different actions and expeditions in which the 169th was engaged, and especially distinguished for the cool and vigilant support which, with six companies under his immediate command, he gave to one of the batteries engaged in a reconnoissance made upon the Edenton Road. On this occasion he was wounded by a fragment of a shell knocking him from hishorse, and his horse was shot through the neck. Subsequent operations carried the regiment to Hanover Court-House, Portsmouth, Va., and to South Carolina, where it participated in the siege of Charleston. In every movenemt, Major Alden was notably prompt to discharge his duty. During this time Col. Buel had resigned, and Lieut.-Col. McConihe had gone north with a recruiting detail; thus, Major Alden was left in charge of the regiment, assuming command Dec. 20, 1863. On April 12, 1864, having received his commission as lieutenant-colonel, Major Alden was mustered into his new rank. April 20th, the regiment was ordered to Virginia, where it was engaged in various battles on the line of the turnpike and railway between Richmond and Petersburg. On every occasion, Lieut.-Col. Alden displayed the same qualities of tactical skill and cool determination for which he had gained repute. On one occasion (Chester Station, May 10th), while in charge of the right wing of the regiment, by skillful, strategic maneuvres and successive impetuous charges, he repulsed an entire brigade of the enemy and saved the Union forces from being flanked and captured. After a series of engagements on this front, the command was ordered to Gen. Grant, reaching the Army of the Potomac in time to engage in the battle of Cold Harbor, June 1, 1864. Here, Lieut.-Col. Alden again distinguished himself, leading his men into action and taking command upon the death of Col. McConihe, who was killed early in the fight. The troops charged and captured the rebel works, and Col. Alden, while planting the regimental color (which he had snatched from its wounded bearer) upon the parapet, was shot in the head and carried from the field. The colonel still carries in his body the leaden relic of that brave charge. The wound then received kept him from duty until August 1st, when he rejoined his regiment. The command was then sent to Dutch Gap, where Col. Alden was put in charge of the troops intrusted with the defense of the working-parties then engaged in the construction of the canal at that point. The colonel shoveled the first spadeful of earth for the Dutch Gap Canal. In September 1864, he was mustered in as colonel, having been promoted with rank to date from June 1st, and participated with his regiment in the first and second Fort Fisher expeditions, Col. Alden commanding the 3d Brigade of Gen. Ames' division during the last attack. After its capture he was placed in command of the fort. Early on the morning of Jan. 16th, while Col. Alden was viewing the captured works, the enemy, by means of electricity, exploded one of the magazines of the fort, and he was thrown more than thirty feet and covered with the falling d�bris of the wrecked magazine. When taken out he was found to be terribly mangled and apparently dead. But even in this extremity the tenacious spirit for which he was remarkable stood by him and brought him back to life. He was conveyed to the officers' hospital at Bedloe's Island, New York Harbor, and continued unconscious for six weeks. He was reported killed, and his friends at home for a week supposed he was dead. At the hospital, his brother Charles Alden remained with him for five weeks. During all this period, in his delirium, he was constantly on duty, issuing his orders and watching every point in his command. Upon his return to consciousness, he was permitted to read his own obituaries published in the papers at that time. He suffered from a comminuted fracture of his right thigh and partial paralysis of his right side, from which he never recovered. Gen. Terry, after the capture of Fort Fisher, made a special report to President Lincoln, recommending Col. Alden (among others) for promotion to be brigadier-general, and the President at once appointed him brigadier-general by brevet. The New York Legislature of 1865 passed a joint resolution thanking Col. Alden and other officers by name for their gallantry at Fort Fisher. In less than three months from the date of his injuries received at the Fort Fisher explosion, he rejoined his regiment, on crutches, ready again for aggressive service. The command was then stationed at Raleigh, N. C., and Col. Alden having now received his well-earned "stars," with the brevet rank of brigadier-general, "for gallantry and meritorious conduct at Fort Fisher," took command of the brigade, and of the post of Raleigh. He also served as president of a military commission for the examination of officers for the standing army. With the muster out of the troops on July 19, 1865, he returned to civil life. Thus ended a brilliant war record. There was not a braver or more faithful soldier in the army. He never sought position; he never shrank from duty. He was conscientious to the last degree in the discharge of every obligation; always at his post when not hindered by honorable wounds; in every emergency and to the last he proved himself to be a model soldier. Upon his return to the duties of civil life, by reason of the suffering resulting from his wounds, he was unable to resume the profession of law. It was a severe trial thus to be cut off from his chosen profession, but he submitted to it under the strict orders of his physician. In the fall of 1865 he was offered a position in the naval office, New York, which he filled till his appointment by President Johnson to the postmastership of Troy, June 1, 1866, which position he held for eight years. On the 5th of April 1866, Gen. Alden was married to Charlotte, daughter of E. N. Dauchy, formerly of Troy, N. Y. Three children have been the fruit of this marriage: Joseph Dauchy Alden, born June 16, 1868; Frederick Alonzo Alden, born Oct. 4, 1873; and Marian Alden, born August 24, 1879. Gen. Alden was appointed brigadier-general of the 10th Brigade, National Guard, State of New York, in 1866, and after eleven years' service he resigned. In closing this sketch, the personal characteristics of Gen. Alden are open to comment. He is a man of positive opinions, honest intention, clear judgment, and vigorous execution. Characteristics like these qualify him for the duties of a soldier, and yet are not incompatible with the duties of a civilian. His military career as above outlined proved him to be not only a brave soldier but also a first-class tactician, cool and clear-headed in action, rigid in discipline, and unrelenting in his opposition to wrong-doing. Men of his stamp always command respect. Prompt to obey his superior officers, he exacted the same measure from those under his command. In fine, he was in every respect a good soldier, fitted to obey, to execute, and to command, and as such deserves the gratitude of every patriot, and honorable remembrance in his country's history. At the organization of the Ninth Presbyterian Church, of Troy, in 1869, he became a member, and was immediately elected to the office of ruling elder, which position he still holds. The same qualities which fitted him to be a good officer in the army fit him to be a good officer in the Christian Church. By all who know him he is to-day regarded as a faithful and outspoken Christian, a patriotic citizen, and a generous and true friend.